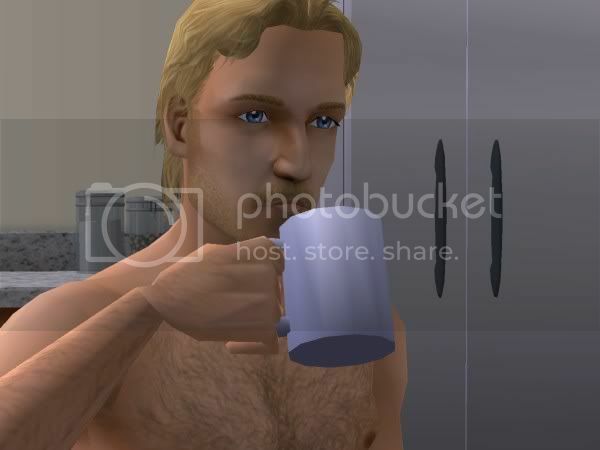 Cindy smiled and gave her husband a cup of strong coffee. “About the same time I did, I think." Cindy poured more coffee and noted the pile of dishes in the sink. She’d done the dishes yesterday. Four times, in fact. But the sink didn’t lie. There were more dirty dishes. Where did they all come from? “Yes.” Cindy’s eyes drifted to the pile of laundry she could just barely see through the entry to the utility room. That was only part of it, she knew. There was another hamper near the kids’ rooms, and another in the master bathroom. She had no doubt they were all full, despite the three loads of wash she’d done the day before. “Why don’t you?” Cindy thought about the pile of bills she needed to pay and the books she had to update. “I dunno…” Brian picked up the television remote and clicked it until he found the weather. He watched it for a while, drinking his now-cooled coffee. “They say it’s not going to rain until Monday.” he mused. “Yes, they were saying that last night.” Cindy replied, pouring herself more coffee. She had a good caffeine buzz going, and she needed it. It was quiet now, with the six children still abed, but already Cindy could hear the sounds of her brood stirring. Cindy sighed. Too often she felt as though she was more of a referee than a mother, and the constant demands of cooking for her family, cleanup, and settling the inevitable disputes left her little time to attend to the other things she needed to do. “Are you getting much out of the garden yet?” Brian asked. “The lettuce looks good." 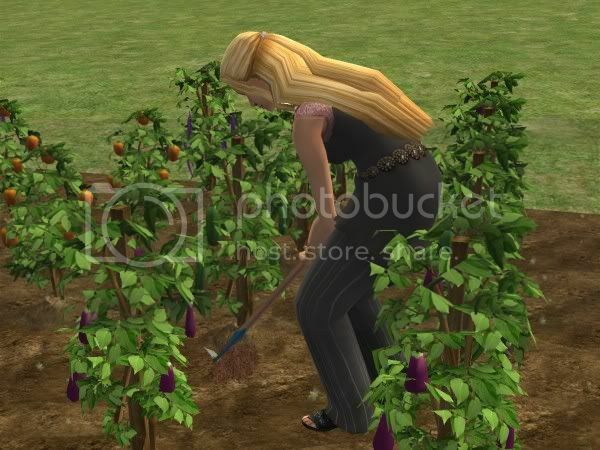 “Yes, I’ve been picking in it almost every day,” Cindy replied. “It needs weeded though. I just haven’t gotten to it.” Hoeing the garden was something Cindy tried to do after she’d put the little ones to bed and the air outside cooled down, but since the baby had been cutting more teeth, he hadn’t been going down quietly, and more often than not Cindy found herself still soothing and rocking him long after sunset. She missed gardening; it was very meditative in its own way, but the baby wouldn’t be a baby forever, and mothers had to do what they had to do. Cindy smiled, and then she gave an ironic sort of laugh. “That just kills me, you know,” she said to Brian, shaking her head disbelievingly. Bonus… REAL PICTURES. 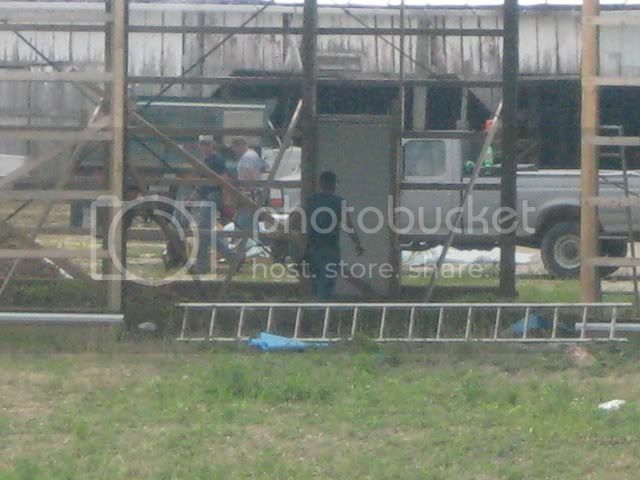 Sorry if the quality isn’t good… I was very far away and zooming with the camera. The new barn under construction. That's Brian in the forefront, and his two cousins in the background. 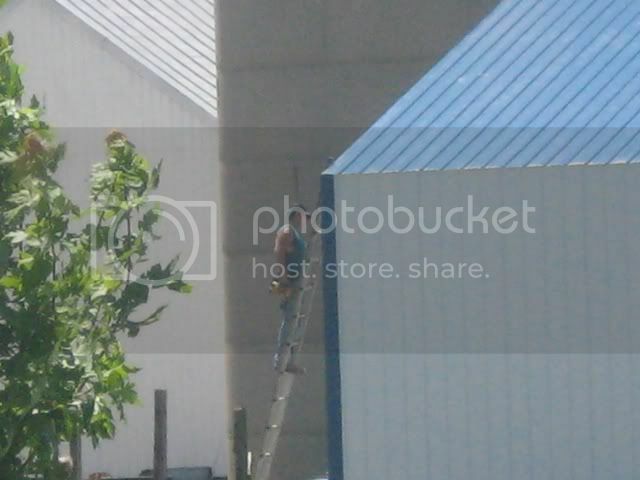 Brian putting up trim on the barn after the siding (tin) was finished. The new combine far far away in the wheat field. 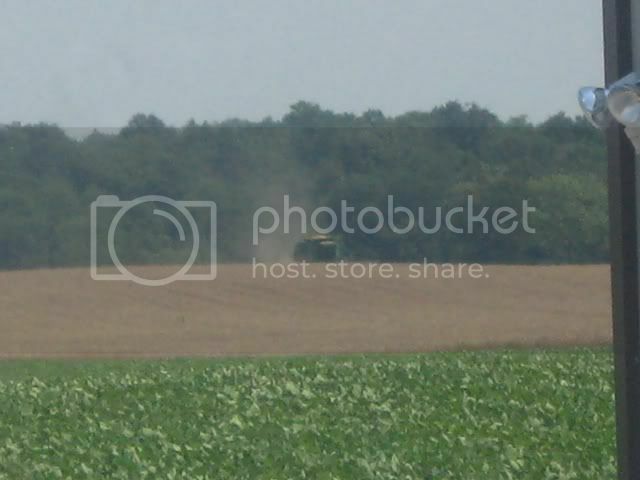 Those are soybeans in the forefront. 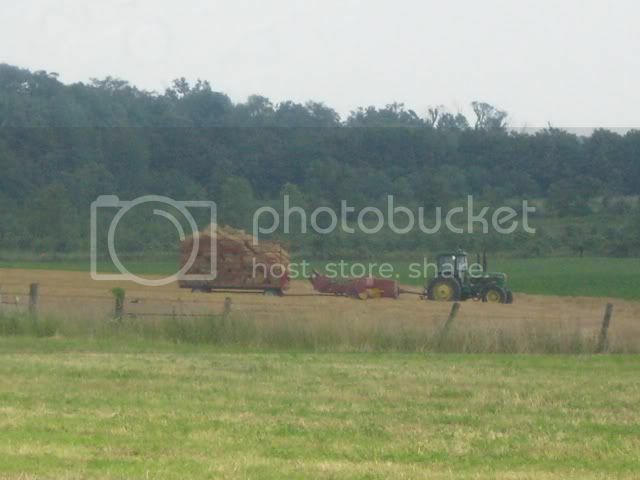 Some of the straw. Yep, they did that today too.